Many languages have a one-to-one spelling-pronunciation relationship, but the English language has no such thing! This is why English pronunciation can be difficult for students to master. On top of the 26 vowel sounds and many tricky consonant sounds, students also need to learn the pronunciation of endings that change according to the last sound of a word. The past tense ending -ed, for example, is pronounced as /t/, /d/, or /ɪd/ depending on the last letter of the verb. Luckily there are easy rules (listed below) for language learners to follow! Voiceless (also called soft or unvoiced) consonants refer to sounds that don’t make your vocal cords vibrate. If you put your hand to your throat when you pronounce these sounds, you won’t feel a vibration. These sounds are all soft like a whisper. Voiceless consonants in English include: /f/, /k/, /p/, /s/, /ʃ/ (also written as /sh/, as in the first sound in “shirt”), /tʃ/ (also written as /ch/, as in the first sound in “cheese”), and /θ/ (also written as /th/, as in the first sound in “thanks”). When a base verb ends in these sounds, the -ed ending is pronounced with the voiceless sound /t/. The reason for this is that it is natural (i.e., easier to pronounce) for a voiceless sound to follow another voiceless sound. If the verb ends with the sound f, k, p, s, ʃ, tʃ, or θ, pronounce the past tense ending as t.
Voiced (also called loud) consonants and vowels refer to sounds that make your vocal cords vibrate. If you put your hand to your throat when you pronounce these sounds, you will feel a vibration. These sounds are all loud—you can hear the noise they make. Voiced consonants in English include: /b/, /dʒ/ (as in the first sound in “jump”), /ʒ/ (also written as /zh/, as in the final sound in “beige”), /g/, /j/ (also written as /y/, as in the first sound in “yes”), /l/, /m/, /n/, /ŋ/ (the “ing” sound), /ð/ (also written as /th/, as in the first sound in “there”), /r/, /v/, /w/, /z/, and any vowel sound. When a base verb ends in these sounds, the -ed ending is pronounced with the voiced sound /d/. The reason for this is that it is natural (i.e., easier to pronounce) for a voiced sound to follow another voiced sound. 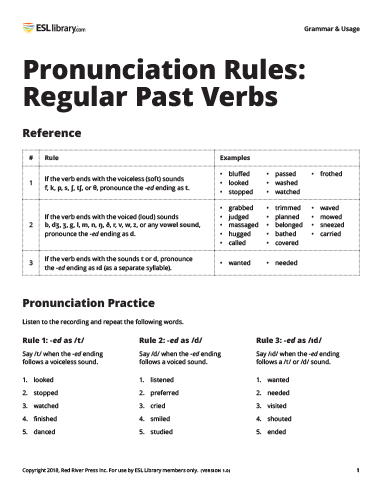 If the verb ends with the sound b, dʒ, ʒ, g, j, l, m, n, ŋ, ð, r, v, w, z, or any vowel sound, pronounce the past tense ending as d.
When a base verb ends in the letters t or d, the -ed ending is pronounced with the syllable /ɪd/ (also written as /əd/ or /ed/—the same vowel sound as the word “it”). The reason we add a whole extra syllable, including a vowel sound, is because it would be impossible to say two /t/ or two /d/ sounds together without a vowel in between. Imagine trying to say “wantt” instead of “wanted” or “needd” instead of “needed”! If the verb ends with the sound t or d, pronounce the past tense ending as ɪd. Play the recording for your students (or read out the words yourself) and have them repeat the words. Say /t/ when the -ed ending follows a voiceless sound. Say /d/ when the -ed ending follows a voiced sound. Say /ɪd/ when the -ed ending follows a /t/ or /d/. Note: The International Phonetic Alphabet (IPA) is used in this post.